Bottlenose Dolphins Spotted Off Canada's Pacific Coast For The First Time : The Two-Way This was a bizarre sight because this kind of dolphin has never before been spotted in this northern area. They like the warmer waters farther south. About 200 were swimming in the group. 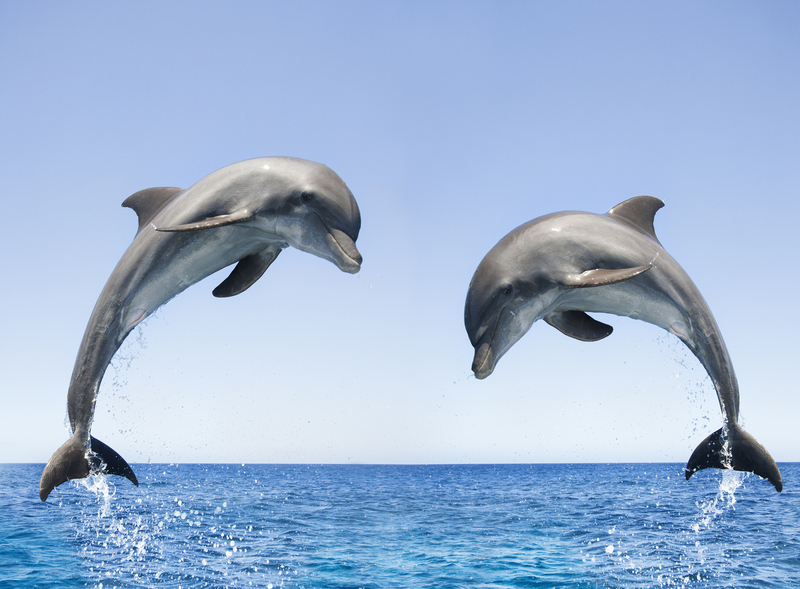 Bottlenose dolphins typically swim in warmer waters, such as this pair jumping in Honduras. "This sighting represents the only occurrence of common bottlenose dolphins recorded in Canadian Pacific waters and, to our knowledge, is the most northerly record for this species in the eastern North Pacific," according to research published Thursday in Marine Biodiversity Records. There's been a recent warming trend in the waters of this area, and that's what the researchers think is likely driving the dolphins to come north. Before this sighting, just three common bottlenose dolphins had been spotted north of California, according to the researchers. These animals were all alone — strange for the species, which lives in groups. They were "most likely vagrant or accidental occurrences." That's probably not the case with such a huge group, seen at 6:45 a.m. in July 2017. At the time, the water was about 61.7 degrees Fahrenheit. The animals seemed healthy and varied in age. And common bottlenose dolphins were not the only species in the group. About 70 false killer whales, another type of dolphin, were swimming with them. "The sighting is also the first offshore report of false killer whales in British Columbia," Luke Halpin, the lead author of the paper, said in a statement. "To see the two species traveling together and interacting was quite special and rare. It is known that common bottlenose dolphins and false killer whales seek each other out and interact, but the purpose of the interactions is unclear." False killer whales also usually live farther south. According to the researchers, this sighting suggests that both species "will naturally range into British Columbia, Canada when conditions are suitable."